(Hong Kong, 22 October 2014) It’s Christmas time when chimes ring out and Santa Claus comes to the City Garden Hotel with heartfelt blessings. Between 12 December 2014 and 1 January 2015, Garden Café at City Garden Hotel warmly presents “The Taste of Christmas” regaling patrons with an irresistible selection of gourmet delights. What’s more, ready to make a wish and realize it with a complimentary choice of Baked Abalone with Paris Sauce, Goose Liver Lollipop or Christmas Snowman. Featuring a world of delectable cuisine with the freshest ingredients, the Christmas Buffet in Garden Café offers an array of seafood ranging from Snow Crab Legs, Pearl Sea Whelks to French Crabs, and mouth-watering dishes such as Lamb Rack,Paella, Tempura and Teppanyaki. Never miss out the Christmas tradition. 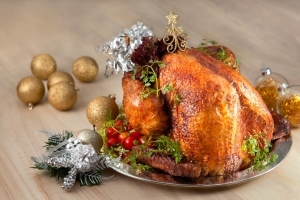 Our innovative Christmas Turkey stuffed with Molten Cheese will surely warm your heart. A 10-pound Roasted Turkey stuffed with Molten Mozzarella Cheese, Hazelnuts and Chicken Liver will be carved tableside every night. Desserts are always the centerpiece of dinner buffet while patrons with a sweet tooth will be surprised by the first-ever LiquidNitrogen Ice-cream station at Garden Café. In partnership with Kitchen Aid, our show stealing Liquid Nitrogen Ice Cream will drive your imagination to feel snow on the tip of your tongue. Liquid Nitrogen Ice Cream is made of -196 oC Liquid Nitrogen and creamy ingredients with chef recommended flavours such as Earl Grey Tea and Smoked Chocolate.This soft and creamy Liquid Nitrogen Ice-cream will be served with the complement of desserts like French Truffle Chocolate or Santa Claus Mousse. It willbe a brand new excitement to the palate. 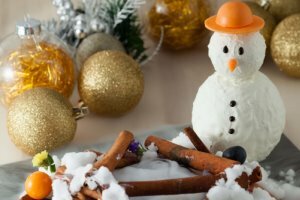 Choosing from a collection of irresistible dishes such as Baked Abalone with Paris Sauce, Goose Liver Lollipop or Christmas Snowman, any patronage of four diners or above can share a greater joy and surprises during Christmas. Relish Baked Abalone with Paris Sauce – a fresh Abalonewith the delicious sauce of Garlic, Shallots, Anchovies, Capers and Curry; tuck into theGoose Liver Lollipop – smooth Goose Liver Moose coated with refreshing Cherry Puree sauce; or Christmas Snowman, an innovative expression of molecular gastronomy, is also a fabulous option for desserts lover. Garden Café Dinner Buffet is priced from HK$ 478 per adult. During the season of giving and hope, everyone can be a Santa Claus! Donate any toys valued at HK$100 or above to receive a HK$100 dining coupon in City Garden Hotel. Facebook Fans can also exchange gifts with us on City Garden Hotel’s Facebook page. By taking photos of your prepared gifts, you stand a chance to win the Christmas hamper, dining vouchers or more. All Christmas gifts collected will be donated to charity sharing the joy in Christmas with children in need.